OC Global led the project management for Thailand’s global gateway. 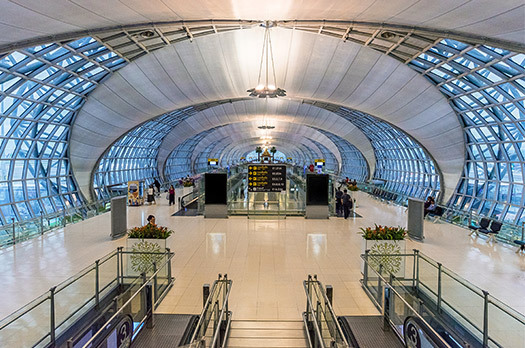 Bangkok’s former international airport at Don Muang was operating beyond its design capacity and lacked space for expansion. The Thai government therefore decided to develop the Suvarnabhumi International Airport (SBIA) on about 3200 ha of land 30 km from Bangkok. The first stage of development, with a design capacity of 45 million passengers per year, positioned SBIA as a major regional hub airport for SE Asia, surpassed only by Singapore’s Changi. Airport construction began in 1999 and was carried out via a series of contracts for design, construction supervision, and construction and equipment supply. The swampy ground conditions presented many engineering challenges. The airport was inaugurated on 28 September 2006. OC Global was the lead consultant of a consortium of five companies that performed the role of project management consultant (PMC). The services covered procurement and tendering, budget and cost control, program management, and monitoring of progress and day-to-day control of engineering design and construction. OC Global also coordinated all associated packages undertaken by other government agencies and private entities. The PMC was responsible for the tendering process as well as the monitoring of construction and contract administration activities. The project was divided into more than 140 work packages with 20 more privatized packages including a hotel and operations facilities for airlines. The initial Phase 1 included a 4000 m runway, a 3700 m runway, and airfield pavements, all capable of accommodating A380 aircraft and 76 aircraft movements per hour. The 563,000 m2 passenger terminal building with 51 contact gates can handle 45 million annual passengers and as of completion was the largest in the world under a single roof. A further 68 remote/cargo positions, car parking, public transport, maintenance and operations facilities are supported by high-tech communications systems. More than 30 km of landside access roads were constructed as associated airport infrastructure and utilities. The airport also boasts the highest air traffic control tower (132 m) in the world. The Airport Master Plan foresees a four-runway configuration with additional mid-field satellite terminals able to handle an ultimate annual capacity of 120 million people and 6.4 million tons of freight per annum. “Aviation is critical to Thailand's economic success. It is the backbone of the tourism industry and provides critical global business links,"
New airport will make air travel more efficient in Mongolia.